LifeWeaving is a dowsing method that allows you to clear karmic programs and problematic emotional blocks that have been with you throughout many lifetimes. Using these dowsing charts can help to restore your ayni by identifying and quickly eliminating energy that is blocking the synchronicity between you and your surroundings. Note that the charts are set up to work with pendulum dowsing but other intuitive methods such as muscle testing can be used. A Chart Key guides the dowser to the different chart options or the alternate charts, or while directional rings in each section guide you to all keywords needed to complete a healing. $30.50 delivered electronically from this website. Which Chart or Charts Should I Buy? 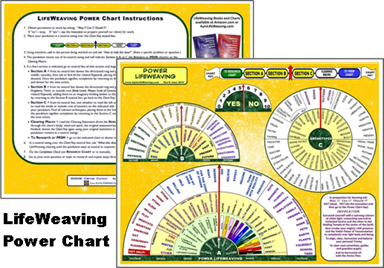 The three LifeWeaving Charts are designed to be used either individually or as a set. 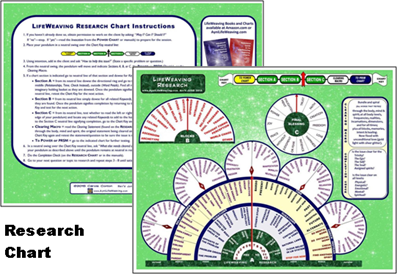 The place to start is with the Power LifeWeaving Chart, which allows you to find what will help clear and heal without needing to research deeper into the why's and who's of the story. The Research Chart can add more details like when, why, who and what to the basic Power LifeWeaving findings. Although this information is not always needed to obtain good blockage clearing, it does give the practitioner and/or client a better understanding of what has been happening and why. 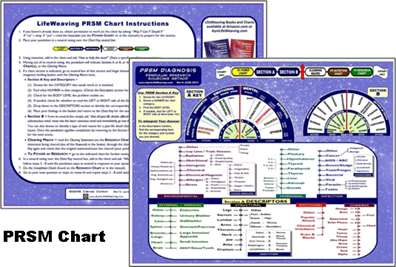 PRSM (Pendulum Research Sourcing Method) Diagnostic Chart is especially useful for energy workers, acupuncturists, massage therapists, etc. as it shows detailed information about where and on what body level a problem resides. Note that this chart must be used in combination with other available diagnostic information, client presentation and symptoms, as well as good common sense.